But the coastline was compelling both on the small and large scale. So here is some of the other work done there. As mentioned before, I felt the urge to disappear into the woodland: 66 steps both east and west, up and down a steep climb. There were some overgrown steps on the western side; coming down first time I did an ungainly skidding swallow dive coming down painfully on my left wrist. Fortunately no lasting harm done and not my main drawing hand. It wasn’t this that deterred me from going back there time and again, it was realising that I can study woodland to my heart’s content at home and that it was the coastline which was the whole point of me being here. At first I was inspired by ‘Bideford Black’ (a pigment historically mined just up the coast http://bidefordblack.blogspot.co.uk/p/history.html) to work in monochrome and while this was satisfying I felt unable to get the quality of the limpid light. Though I did try and these are some B&W sketches. … but concentrated thereafter on the cliffs and shoreline. I have subsequently been developing the Pebble series because of its enormous possibilities. I’ll post some of this work later and hope also to show some paintings from these same sources before too long. You confront a real painting (I don’t mean on-line reproductions, postcards or even high quality book illustrations) pretty much exactly as the artist did – at the same distance – as he or she did at the moment when (s)he contemplated the finished work and felt content with it. The visual experience is the same: you breathe on it in the same way and it responds. This is demonstrably not the case with music, film or writing for any medium – all of which require an intermediary and very often several or even a team. You are only reading this because it’s been through several machines. This is all fine but an exhibition of paintings is a two-way thing. A meaningless exercise if one half of the equation is missing. It is unbalanced, there is no conversation. Paintings without people, talk to themselves or merely stare bleakly at each other across the void. The painter provides the paintings, the gallery provides the space, and both parties promote it as best they can. That’s how it works; the only way it can work. If a painter spends years in oblivion wrestling work out of heart, soul and mind, he can legitimately feel disappointed if the gallery falls short. This is the second year running I’ve been let down by a gallery. Not tuppeny-ha’penny galleries but pukka ones. The exhibition with ceramicist Eilean Eland suffered from poor gallery publicity before and during the event. As artists, we did all we could: half-page illustrated articles in quality regional and local journals but both galleries did very little. Why that should be must be the subject for another time. Nevertheless, those visitors who did attend were enthusiastic; words like “stunning”, “vibrant” and “expressive” cropping up in the Visitors’ Book but during most of my attendances, the gallery was often empty. Stairs from the busy shop and café one floor down appeared to be an obstacle too far. To be fair, there was little incentive from the Arts Centre – not the box office, shop or counter – to encourage movement beyond the caffe lattes. This was particularly depressing because we were in an Arts Centre and not a café. I felt sorry for my paintings and for Eilean’s terrific sculptures in having little or no human company. They felt neglected. Most artists need interaction with their audience. Imagine live theatre or an orchestra playing to an empty auditorium, or an important football game before no spectators. You cannot expect anyone to be at their best. In a previous life, I’ve been a cinema projectionist several times, and occasionally had to show films – usually in matinees – to literally one or two aged people. Even though technically it made no difference to putting on a good ‘performance’, it always felt a tad futile. Above are two versions of a Study of anemones after Vassyl Khmeluk. 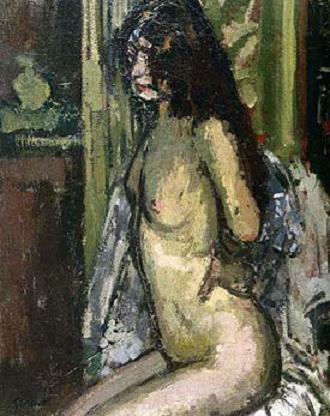 I fell in love with the original of this painting from a tiny reproduction in a newspaper. Khmeluk (1903-86) was a Russian painter who has for me become a favourite (see previous post That loving feeling. Copying this got me back into painting after my Blighty Girls experience last year (see previous post My dear blighty girls). The anemones remain favourite paintings despite or perhaps because of that difficult time. It was, technically, an intriguing exercise which I hoped might rub off on visitors. Two people did indeed tell me (unsolicited) that they were their favourite paintings but otherwise I noticed little engagement with the more ‘challenging’ paintings throughout September at The Plough Arts Centre in North Devon. Since very few people reading this will have got to the show, I’ll include some photos to give an idea of the venue and exhibition. It was an opportunity for me to show some of my ‘still-life’ studies. In my naivety I thought it the most ‘commercial’ of the three exhibitions I’ve had at The Plough Arts Centre, but it’s difficult to sell if no-one much comes. Are we down-hearted? Yes, I suppose we are a bit, but no doubt something will happen to buck up the spirits: Carry on regardless (now that’s a film I probably showed once!). Actually, something has come along because I’ve just sold my third painting in 12 months to America without any opportunity of them being breathed upon by any of the buyers. Why Americans seem to like my paintings more than the British is a mystery to me. A gallery owner in Cornwall last week said that perhaps it was because they felt French (or was it because of my beret?). I love France inordinately but think I have only two paintings there, and I always feel they are more German than French, but maybe not the still-lifes. Any comments? I had just returned from seeing this superb little exhibition at the Courtauld Galleries at Somerset House. ‘Little’ in size perhaps but most certainly not in scope, depth and value to the serious modern artist. To be able to get beneath the surface of these important works, see how the concept was developed, the thinking and process made manifest was vital to me as someone whose valued Cezanne above all others for some 40 years. And moreover to get up tight to the paint surface and see the application and colours (so often corrupted by the printing process) for real was a unique opportunity: these paintings and drawings will never again be reunited in our lifetime. Only two were missing, one from the Barnes Foundation (who aren’t allowed to loan out works) and one in private hands who were regrettably unwilling to lend. 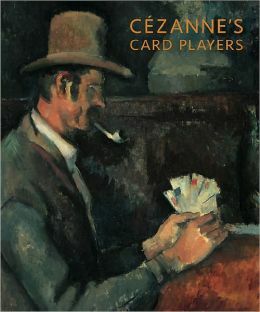 Going back to look at some of Cezanne’s writings, I came across some timely thoughts. One in particular seemed germaine, “Art never addresses itself to more than an extremely small number of individuals“. I heard someone at the exhibition say, “Are all these by Cezanne?”..! The mark of a good exhibition for me is one that gets me leaping back to my own easel while reassuring me that I’m going in the right direction. [February 2014] Well I was then but not now for I’ve been away, battling with science and the corruption of it by politicians. I’m waiting for a visit from Cezanne (he usually sits on my shoulder, grumbling and encouraging) or someone to gee me up and make me see the beauty all around me once again. I hope to run some of my blog activity here as well. This is from 7th March 2011 – we’re not quite there yet but Snowdrops and Daffodils are showing here in North Devon. Hmmm, anyway, schoolboy fantasies aside, green is everywhere, yet fiendishly difficult to nail down accurately. We search for equivalents. Although I no longer venture out much into the field (other than with sketchbook and trusty small tin of oil pastels and chinagraphs) the colour is still there – taunting and frustrating!